Big Badda Boom – Pressure is Dangerous! Shiny new Chronicals awaiting a good cleaning and passivation. 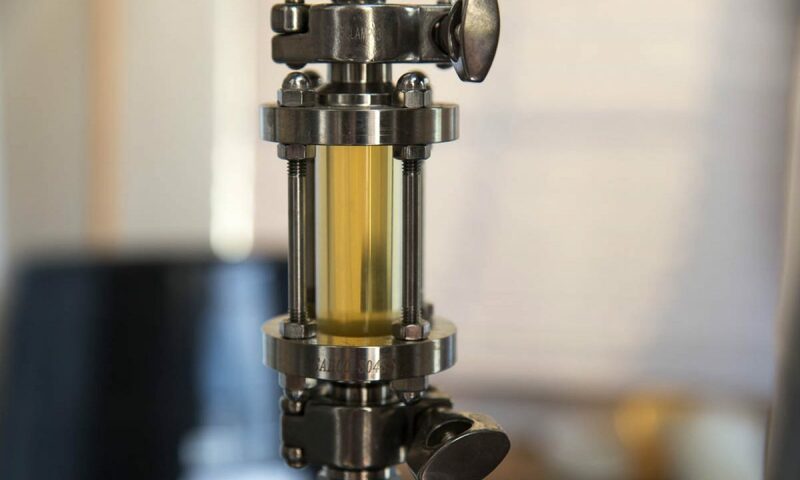 So this was going to be an article on how I expanded my fermentation capability by 1 BBL, and with an explanation on why I chose the solution and vendor. It will turn into a severe WARNING to everyone that pressure, even as low as the pressure we use with corny kegs, is dangerous! So what does this have to do with fermentation? So please pause for a few words about safety! It takes very little pressure, released suddenly to harm someone. A little Google searching can illustrate the dangers of steam pressure in a sanke keg. This can be fatal. I am afraid that we as homebrewers so often get comfortable and lazy about handling the pressure for kegging that we forget how dangerous it can be. A week ago, I dry hopped a batch of American Brown ale. At the time, I also attached a pressure valve that allows me to measure the pressure and add additional Co2 when needed. I also use CO2 to transfer from conicals into kegs. Earlier this week, I tasted and decided to cold crash. Since I had put the PRV on, I added a few pounds of CO2 pressure and let the freezer and controller do its thing. This morning, I went to check gravity and clarity of the Brown ale, and when I opened the sample valve, air sucked in backwards causing bubbling. I panicked, not wanting 11 gallons of oxidized ale. So I grabbed my Co2 tank, connected it and opened the valve. The pressure set immediately. The next few seconds were sheer terror and panic. The little PRV valve on the lid of this conical whistled (you can see it below, a button on the lid). Then there was a weird creaking noise, like twisting metal. And then BOOM. My hair blew back and next thing you know, lid is crooked and the gasket hangs over the side. I grabbed the bottle of Co2 and shut it off…. I then realized I had the pressure set at about 15-20 PSI to seal the lid on some cornys I had filled earlier in the week. I didn’t verify and adjust down the pressure before connecting to the conical – and the lid system failed. Spring Steel clamps lock the lid when the Spring Latch is closed. With the silicon gasket in the lid, creates a tight seal. Failed in a good way however. The conical lid design was such that the clamps that hold the lid deformed, yet they held the lid on, while decompressing. Yeah those little clips on the lid in the picture above! I grabbed the lid, cleaned it and the gasket and reseated as quickly as possible. I then discovered that the clamps are wrecked – and sit limp. They will not hold any pressure on the lid. I am fine by the way – just a bit disappointed that I made such a stupid mistake! So – I expanded my fermentation space, essentially tripling my controlled fermentation capacity. I have been using a MoreBeer Ultimate Conical for the past couple of years. I love it, but it can be difficult to clean, and just does not keep up with cooler ferments in my hot Texas garage. So I have been mulling over other options. A good friend in the Zealots has a full size walk-in cooler and two temperature controlled ‘chambers’ or closets that utilize the cool air from the walk-in. I would love the walk-in, but don’t need it, and decided after a lot of looking to buy 2 upright freezers and conical fermenters. This weighed against the costs of buying two more Ultimates seemed like a bargain. The Chronical in Fridgedaire 20.5 cubic foot freezer. Plenty of room for a carboy or a Brewbucket on the side! Please understand I have nothing against buckets or carboys and use them often, especially for sour beer and experiments. Conicals have many features that are attractive, including easy racking and sampling. I looked at a number of suppliers and locked onto SS Brewing Technologies pretty quickly. The feedback I have seen on their Brew Bucket has been pretty good, and the fact that the ½ BBL Chronical used tri-clamp fittings was a bonus. I have collected a few parts over the years and 1 ½ TC elements from the Ultimate could be used with these. 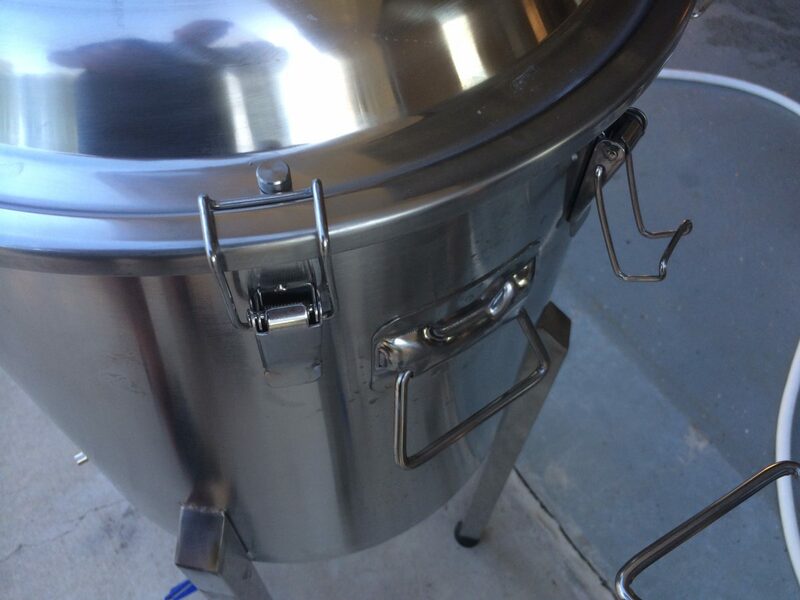 I pulled the trigger on two beautiful Chronical Half Barrel Fermenters. As a bonus, the new homebrew supply said they could order them and gave me a good deal compared to purchasing online. While I waited, I hit up Lowes and found a sale was on – and purchased 2 20.5 cubic foot freezers. Freezers came and were installed side by side. I even left the protective plastic on them. Hooked up the Johnson digital controllers and waited. 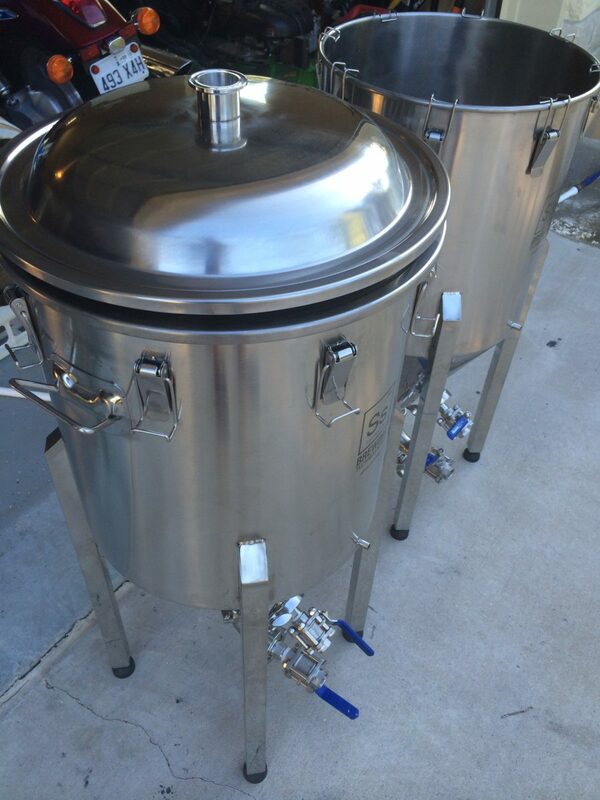 It took an extra couple of days, but the fermenters arrived and I picked them up. Next day, went through the cleaning and passivization process and installed them into my freezers. I can also fit a full size 6 gallon carboy next to these bad boys – bonus! Later that weekend, I brewed the hoppy American Brown ale mentioned above. SS Brewing Technology products are both well-made and sensibly priced. When you compare to similar products and price points, there is little to criticize. I buy high-end gear and this stuff is comparable in quality to anything out there from Blichmann or MoreBeer. The steel is bright and shiny, but there are flaws, as there will always be, where you can see welds or a small scratch. You will need to passivate and clean before filling them – but easy enough. The flexibility of the racking arm and the dump valve, and using my existing TC components is a big asset. I highly recommend their products. Now – back to today’s lesson – ALWAYS check the pressure of your tank before you connect it to any vessel! PERIOD! 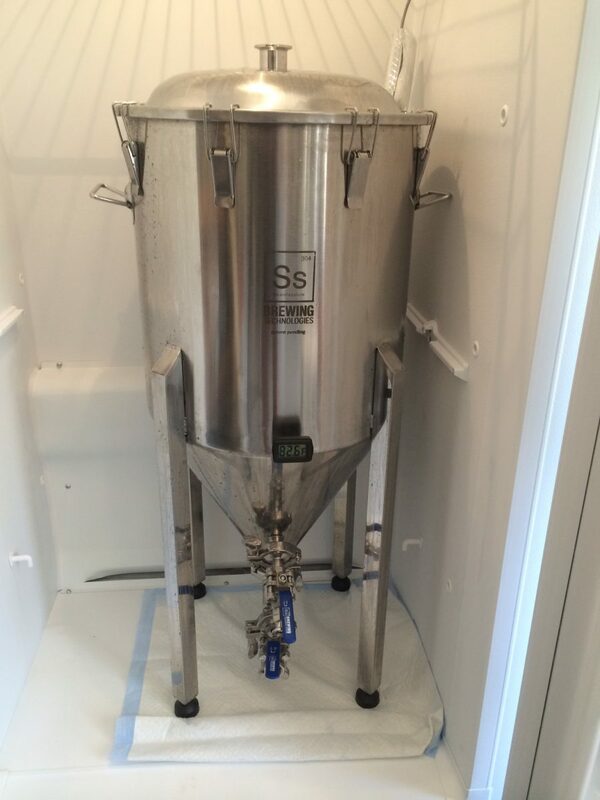 Looking forward to tomorrow – time to fill the other fermenter! This weekend, happy to report that both fermenters are full and chugging away. I failed to mention that while cleaning out the fermenter, I was able to carefully bend back the lid clamps. They are spring steel and take a bit of patience. Use pliers, but wrap the teeth with a soft cloth. First I bent the top of the clamps back to a 90 degree angle to the longer legs, and then added a little bit of a bow or curl inward to the legs, working from the middle. As you do this – it may twist a bit – but you can twist the clamp opposite carefully and it should return true. I tested each on on the lid without the silicon gasket in place to ensure a snug fit when the spring clamp was lowered. 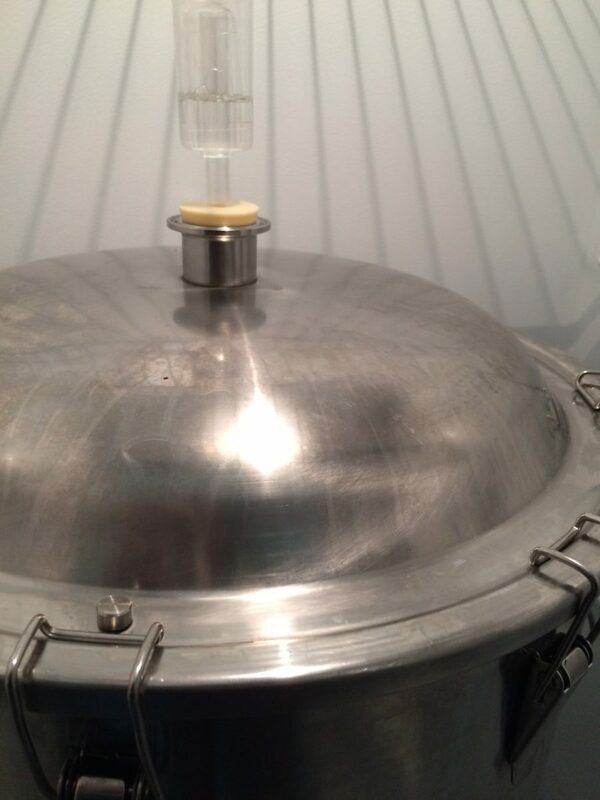 Happily – the lid and clamps, with the gasket are holding a seal and 12 gallons of IPA is happily fermenting! Nice blog Matt. My fermenting freezer recently died because of something stupid I did so I am in search of a new one. I do not have a 1/2 bbl chronical yet, but plan to get one in the future, so I would like to make sure that in will fit in whatever I buy. I have looked at the SS brew tech website and they list the width at 18″. I have been around measuring freezers at all of the appliance stores. It looks the depth with the hump in the back on the frigidaires that I have seen, it would just barely squeeze in, and the door shelves would have to be taken off. Was this the case with yours? It also looks like the front legs of the chronical would be resting on the back side of the angled molding at the front of the floor. Did you find that to be the case with yours? I am slightly concerned about being able to fit the chronical in the freezers that I am seeing, but I haven’t been able to find any so far that are any deeper. I shared your concern. I cut out a cardboard round, based on the legs diameter, scored to fold up to the square made by the legs. So if the legs clear the little hump in the back, then you just need to worry about clearance for the conical body. I should add that I measured the same depth for the 16/18 cubic feet as the 22/24 cubit foot freezers – and the only benefit with the larger is that I can have a shelf above the conical which is useful – or fit a corny keg next to the fermenter. I am considering removing the door shelves because the bottom shelfs cannot be snapped out – looks like the whole molded plastic insert comes out with a few screws. Contact me through the contact form on the “About” section – and I can email you some photos. I’ve got two of these bad boys too. I’ve been looking at configuring for pressurized transfers. As I was talking to the great and very knowledgeable folks at MoreBeer, they highly recommended configuring the pressurization rig with it’s own pressure gauge and pressure relief valve (basically, a splundig valve). I kinda poo-pooed that idea thinking that it was overkill because the lid has that pressure relief button on it, but seeing this post convinces me otherwise. So thanks for the write-up! Would like to hear more about how you do your pressurized transfers with these conicals. Will scan your postings here – maybe you already wrote it up – but if not – there’s an idea for a future posting. Works well… I keep the pressure just over 1 psi and it works really well. Just pull trub from the bottom till it clears and rack from above with just the little pressure! And gratz! The guys at SSBrewtech are awesome!